When I attended the River School’s promotion ceremony of its 8th graders last night, I experienced this kind of integrated self-actualization in the students, a process and journey that started in 6th grade and through mistakes, reflection, risk-taking, and adults’ care and support, resulted in self-wisdom three years later. One of the student speakers shared the challenges of his 6th grade year when his mother passed away from a brain tumor. I recall how lost he was for most of that year, how he went home several times because he didn’t feel well and couldn’t get through the day. His grief and “drifting at sea-ness” was palpable as our staff supported him through that first year. He talked about slowing emerging from the fog in his seventh grade year. 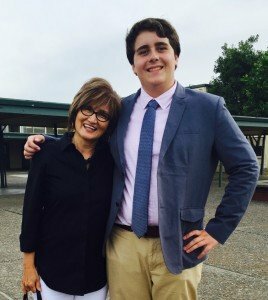 He blossomed in his eighth grade year, coming into his own power and into his own voice to be able to speak confidently and authentically at his promotion about his three years at River. We were all enthralled by the “realness” of his presence before five hundred friends and family gathered for the promotion ceremony. To see such wisdom in someone so young was moving and a gift. By his “beingness,” he made such a positive impact on his classmates. It was obvious by their response throughout his speech, he is held in high esteem by his classmates. Educating self-actualized students can happen when the mission includes this vision and when the environment – the hidden or implicit curriculum – of a school nurtures the social and emotional needs of students. Especially in middle school, their need to feel belonging and acceptance is critical to the developmental process in order to actualize their unique identity. John Goodlad said in his book, In Praise of Education, that “A self cannot be fully realized apart from culture.” When the culture supports the growing self-awareness of the students, they come into their own authenticity. Their confidence is grounded less on what others think of them but on what they have come to know and accept about themselves. Each year I am amazed by their wisdom. I don’t really think I learned some of these lessons until I was in college. And then to be able to articulate these self-actualized thoughts to their peers and to an audience of five hundred is breathtaking. This kind of “implicit” curriculum is focused on building capacity of students from the inside out, from an intentional focus on developing character and integrity, from self-awareness and self-reflection, from daring to speak their truth, and from the adults who listen deeply because they care. If all schools nurtured such students, the world would be a different place.